Jusuf Nurkic of the Portland Trail Blazers is introduced before the game against the Brooklyn Nets on March 25, 2019 at the Moda Center in Portland, Oregon. 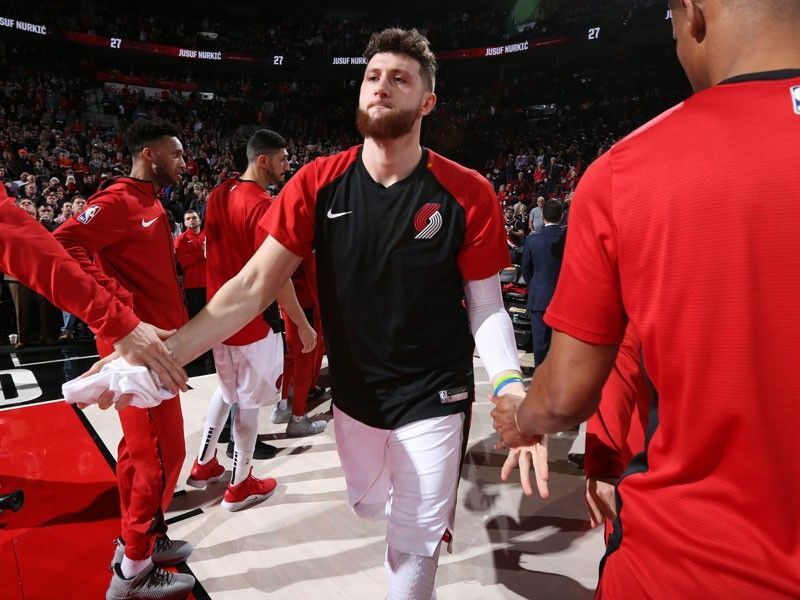 LOS ANGELES – Jusuf Nurkic suffered a horrific leg injury while helping the Portland Trail Blazers to a 148-144 victory over the Brooklyn Nets in double overtime on Monday (Tuesday Manila time). Nurkic led the scoring for the Blazers with 32 points while adding 16 rebounds and five assists at the Moda Center in Portland. But the 24-year-old Bosnian's evening ended in despair when he collapsed to the court in agony after suffering a gruesome looking injury in overtime. Nurkic's left leg buckled beneath him as he landed after attempting to tip in a shot. Several players from both sides visibly recoiled after seeing the severity of Nurkic's injury, which sent the arena into a concerned hush. Nurkic was treated by medical personnel with a towel masking his face before being stretchered off the court. The Bosnian big man had been enjoying the best season of his career, averaging 15.4 points, 10.3 rebounds and 1.4 blocks per game before Monday.